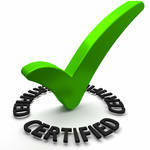 At Murray Associates professional certifications are taken seriously. Our certifications required extensive training and testing to attain. We fulfill annual requirements to maintain certification. Our credentials are well recognized in the security industry, and relevant to solving our clients’ concerns. Professional certifications are not permanently awarded. Certifications typically must be renewed every 2-3 years. Re-certification requires proof of continuing education, professional achievements and active participation in the field. Simply paying a renewal fee is not sufficient. What are the Qualifications to become a Private Detective? -Applicant must be 25 years of age and a U.S. citizen. -Applicant must possess good character, competency and integrity. -Applicant must have a minimum of 5 years experience with an organized police department of the State, County or a Municipality or an investigative agency of the United States of America or possess 5 years investigative experience which can be documented. Applicant must successfully complete a comprehensive background investigation, which includes a criminal history fingerprint check, and credit check. As part of the application process, a credit profile report will be reviewed for any derogatory, delinquent, and/or past due accounts. Applicants must provide documentation addressing all derogatory accounts prior to licensing. Personal credit is directly related to moral character. An individual may only serve as qualifier for one agency, however they may hold a corporate office position for more than one company.